Federal government redistribution programs don’t work. We’ve ignored the lessons of history about the dangers of government intervention, so is it any mystery that we now have millions of people mired in dependency. Yet some people in Washington want to double down on failure. Chris Edwards of the Cato Institute, joined by Veronique de Rugy of the Mercatus Center, are understandably distressed that so many politicians – on both sides of the aisle – want to expand the amount of money being redistributed by the federal government. In a new Tax and Budget Bulletin, they make a very compelling case that the so-called earned income tax credit should be abolished rather than expanded. …the earned income tax credit (EITC)…is a huge program. In 2015 it will provide an estimated $69 billion in benefits to 28 million recipients. The EITC is the largest federal cash transfer program for low-income households. …While the EITC is administered through the tax code, it is primarily a spending program. The EITC is “refundable,” meaning that individuals who pay no income taxes are nonetheless eligible to receive a payment from the U.S. Treasury. Of the $69 billion in benefits this year, about 88 percent, or $60 billion, is spending. Now let’s look at some of the details. As is so often the case with government programs, the EITC started small but then quickly expanded. In the early 1970s, policymakers considered ways to combat the anti-work effects of the growing welfare state. But rather than reining in the welfare state, they decided to expand it in 1975 by enacting the EITC. The credit was aimed at reviving work incentives… Initially, it was a 10- percent wage credit with a maximum value of $400… The EITC is a much larger program today than in 1975. It has credit rates up to 45 percent and a maximum credit of $6,242 in 2015. … expansions in 1986, 1990, 1993, and 2009 greatly increased the costs. 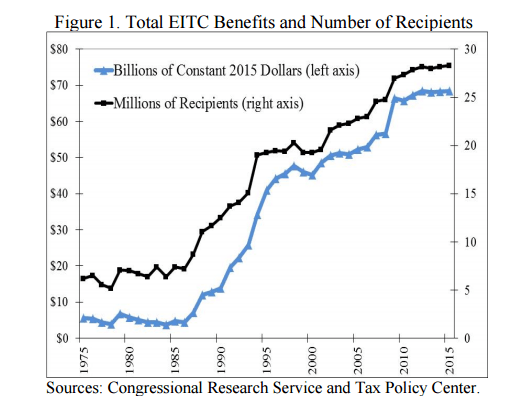 …The EITC has increasingly become a spending program over time. The refundable portion of benefits has risen from 70 percent in 1990 to about 88 percent today. Here’s a chart from their study showing both the growing number of dependents and the growing burden on taxpayers. I have to imagine that this makes the EITC the fastest-growing redistribution program in Washington. Chris and Veronique then list some of the reasons why the EITC is a harmful form of income redistribution. First, it drives down wages, which hurts low-skilled workers who can’t get EITC payments while also providing undeserved subsidies for employers. One side effect of the EITC is that, to the extent it works by pushing down market wages, it ends up hurting low earners who receive no EITC or a small EITC— mainly childless workers. The labor-supply effect of the EITC also means that the program acts partly as a subsidy to businesses that hire lower-skilled workers because they are able to pay reduced market wages. Second, while supporters correctly argue that the EITC encourages poor people to enter the labor force (the handouts are tied to earning money), they conveniently overlook the fact that the program penalizes people who want to work more hours and climb the economic ladder. …people have an incentive to reduce hours worked in both the flat and phase-out ranges of the credit. As it turns out, about three-quarters of people taking the EITC are in those two ranges where the work incentives are negative. …Consider a single parent with two children, as in Figure 2. She would have a disincentive to increase her work effort in the large income range from $13,870 all the way to $44,454. Here’s a table from the report. The last column shows the “phase-out rate,” which is akin to a marginal tax rate on workers as they seek to earn more income. Keep in mind that these workers, depending on their incomes, will also be paying the payroll tax and the income tax. So it’s easy to see why poor people face very high marginal tax rates that discourage them from additional productive effort. Third, the EITC is riddled with fraud. The EITC error rate has been more than 20 percent since at least the 1980s. The Internal Revenue Service reports that the EITC error and fraud rate in 2014 was 27 percent, which amounted to $18 billion in overpayments. Though I guess we shouldn’t be surprised. There’s lots of Medicare fraud, Medicaid fraud, Food Stamps fraud, and disability fraud, so this just seems to be an inevitable additional cost when governments spend money. Fourth, the EITC is absurdly complex (like other parts of the tax code). The EITC is a particularly complex credit. Benefits change as income rises, with four phase-in rates and three phase-out rates. It is adjusted by filing status and number of children. The rules regarding child eligibility are complex due to issues such as separation and divorce. There are rules and calculations regarding earned income, investment income, and adjusted gross income. …For individuals, the IRS guidebook for the EITC (Publication 596) is 37 pages long. But the rules are so complicated that more than two-thirds of all tax returns claiming the EITC are done by paid preparers. Fifth, like all other forms of government spending, it’s important to calculate the economic burden that is imposed when resources are taken from the productive sector of the economy and transferred to government. The process of extracting taxes damages the economy because it causes people to reduce their productive activities, such as working and investing. The harm from the behavioral responses to higher taxes is called “deadweight losses.” For the federal income tax, studies have found, on average, that the deadweight loss of raising taxes by a dollar is roughly 30 to 50 cents. … expanding the EITC—or any other federal spending program—would ultimately mean higher taxes, and thus more tax distortions and higher deadweight losses. Well, since great minds think alike, you won’t be surprised to see that Chris and Veronique also want to get the federal government out of the redistribution racket. The EITC should not be expanded. Indeed, the best long-term solution would be to end the EITC, while also cutting other welfare programs… The credit creates a modest increase in workforce participation by single mothers, but that benefit is outweighed by the work disincentives during the phase-out range, billions of dollars of errors and fraud, substantial paperwork costs, and the damage caused by the higher taxes needed to fund the program. As I’ve repeatedly explained, redistribution programs are bad news for both poor people and taxpayers. Yet our statist friends want to make the current system worse, with proposals for a government-guaranteed income. And they’re willing to lie to advance their agenda. P.S. Click here for a video that explains why free markets are better than redistribution if you really want to help the less fortunate. 66B$ compared to the 2+T$ spent on foreign wars & foreign nation-building that was NEVER necessary?? I’d vote for helping OUR poor people to get paid a living wage–rather than wasting 30+ times the $ on unnecessary wars. Milton Friedman would be offended that you called him a statist, since he was in favor of a guaranteed income instead of means-testing programs. Means-tested programs create two major problems: First is the disincentive against earning income. Second, each agency (EITC being the current example) has an incentive to promote and expand itself. A guaranteed income going to all adult citizens that would not be affected by earned income would eliminate both problems. Federal welfare could be eliminated. There would be no increase in current costs, if you eliminate all means-tested programs that do not relate to pre-existing medical conditions; and you apply the cost of current tax deductions. You could then institute a true flat tax on all earned income, since the effective tax rate on those with incomes under $100,000 would be far less than the flat tax rate. This approach would bypass the bureaucrats. You could eliminate close to one million federal jobs from means-tested programs and the IRS. There would be no need for employees to file annual income tax forms. While you would not be reducing the size of government in terms of dollars spent, you would almost cut in half the number of people working for government, or about $50+ billion in overhead. This also follows the Mitchell Golden Rule, in that the cost would grow with inflation and the growth of the citizen population, or 0.9% real growth. Given that one million people would be added to the productive work force, plus a drastic reduction in the 6 billion man-hours required to file taxes; the increases in cost going forward net out negatively. Growth in the economy unrelated to those aspects would boom. The idea of giving money directly to citizens is a better alternative than the current system of filtering funds through the bureaucracy. Decline is now baked in the cake. American voters have crossed the rubicon. From now on ever more money will have to be shelled out to buy votes. …Flattening the effort reward curve to European levels, and having our anemic two percent growth trendline (half the world average) converge to the European one percent growth trendline.